Supported by the World Wildlife Fund, American College of Traditional Chinese Medicine (ACTCM) and American Chinese Zhi-Qing (Intellectuals) Association (ACIA) initiated a preparatory committee for the establishment of the Chinese Association for World Wildlife Conservation (CAWWC). The committee drafted the mission statement and planned activities for the wildlife conservation. These activities included: (1) Initiated a wildlife conservation campaign in the Chinese community in the name of "Saving Tigers in the Year of the Tiger". (2) a signature drive for the promotion of "Saving Tigers in the Year of the Tiger", (3) Tiger Painting competition for children, (4) Tiger Awareness Day Tour in San Francisco Zoo, and (5) an international conference in the topic on tiger conservation. The opening ceremony of the signature drive for "Saving Tigers in the Year of the Tiger" promotion was held in San Francisco Chinatown. Immediately after the opening ceremony, some well-known Chinese calligraphers offered their artwork to the audience in the form of writing Chinese Spring Festival couplets. Over 200 signatures were collected during the two-hour Chinese couplet writing activity. At the same night, volunteers printed posters of tiger conservation for the future events. The Chinese Association for World Wildlife Conservation invited Mr. Albert C. Chang, president of the Eastern Sea, Inc., Professor Ching Sen Yeung, Commissioner of the Education Commission of the States, Florence Fang and Lily Chan, Commissioners of San Francisco Film and Video Arts Commission and other influential leading figures in the Chinese community as advisors. Sponsored by Metlife, a booth decorated in the theme of tiger conservation attracted big crowds in the Chinese New Year Fair in Oakland Chinatown. Over 600 people signed to support the promotion of "Saving Tigers in the Year of the Tiger". Mr. Benjamin Lo, Director of Taipei Economic and Cultural Office in San Francisco, again signed to support our event. Over 500 signatures were collected at a meeting sonsored by the New Xontinent, an influential Chinese newspaper in the U.S. Mr. Wang Yusheng, the deputy Consul General of the People's Republic of China in San Francisco and his wife signed at the signature drive to show their support. A huge "Saving Tigers" display board caught attention of the crowds. A "How Much Do You Know about Tiger Conservation?" contest was held with prizes for winners. Lily Liu, the chief editor of the World Journal, the most influential newspaper in Chinese, donated eight copies of her books as the prizes. A Tiger Conservation exhibition was held at a prom sponsored by Chinese Enterprises Association, Five hundred signatures were collected at the prom. Mr. Wang Yusheng, deputy Consul General of the People's Republic of China in San Francisxo, and his wife once again signed their names to show their support to the promotion of "Saving Tigers in the Year of the Tiger". The design of the "Tiger Conservation" signature commemorative card was completed put into production, which played an important role in the following signature drive activities. Over a hundred companies, associations, unions, and educational institutions were involved in the "Saving Tigers in the Year of the Tiger" promotion and showed their support to the founding of the Chinese Association for World Wildlife Conservation (CAWWC). In the morning, Mr. Ming Kang-Dai, president of American Chinese Zhi-Qing (Intellectuals) Association, gave a speech on tiger conservation to over 6000 audience at the Bay Area American Chinese Sports Game. All the members of the planning committee of the Bay Area American Chinese Sports Game signed to suppot tiger conservation. Mr. Benjamin Lo, Firector of Taipei Economic and Cultural Office in San Francisco, once again, signed at the game. Chinese Association for World Wildlife Conservation was officially established in Grand Palace in San Francisco Chinatown. The founding of CAWWC added an illustrious chapter to the history of the American Chinese in the participation of the wildlife conservation movement. The oopening ceremony attracted many people from the public, including environmentalists and news reporters, regardless of the heavy rain in San Francisco. Ginette Hemley, director of the International Wildlife Policy of the World Wildlife Fund, and the other three representatives from WWF attended the meeting from Washington D.C.. Governor Wilson and San Francisco Mayor, Brown also declared February 6th as the Wildlfe Conservation Day in San Francisco. In the afternoon, volunteers gathered more than 200 signatures from a Chinese New-Year celebration held by the Bay Area Northeastern Chinese Association. Cupertino Mayor Michael Chang attended the celebration and signed to support the tiger conservation activities. At noon, CAWWC representatives attended the Chinese New Year celebration sponsored by the Chinese Artist Association in the Golden Dragon Restaurant in San Francisco. Over 200 participants signed to support the Saving Tigers promotion. In the evening, members of CAWWC attended another Chinese New Year celebration in Xinyi Chinese School in Campbell. Members of CAWWC delivered the message of the wildlife conservation to the children through interesting games with prizes. 200 more signatures were gathered again in the Chinese school. Lixin Huang, Vice-president of the Chinese Association for World Wildlife Conservation, attended the National Conference of Tiger Conservation in the title of "Facing the Year 2000" in Dallas. The participants were very impressed by her speech regarding the activities carried out by the Chinese Americans in Northern California, and the Conference highly praised the outstanding contribution to the world wildlife conservation made by CAWWC. Twenty doctors and medical workers offered free physical examinations in the name of tiger conservation to over 200 people in public in San Francisco and San Jose. All the people who received the physical examination signed to support tiger conservation. In the Chinese Lantern Fair in San Francisco Chinatown, volunteers distributed tiger conservation pamphlets to the public and gathered 500 more signatures. In order to have the students from Chinese school be involved in the tiger conservation activities, CAWWC members planned a signature drive contest for the promotion of "Saving Tigers in the Year of the Tiger" and the Tiger Painting contest for the students under 18. Cupertino Mayor Michael Chang was the honorary Chairman and Mr. Albert Chang was the Chairman of the contests. In the afternoon, supported by Betty L. Yuan, President of Northern California Chinese School Association, and Lily Wei, Secretary General of NCCSA, Mr. Ming-Kang Dai, vice president of the Chinese Association for World Wildlife Conservation, Professor Ching Sen Yeung, Commissioner of the Education Commission of the States, and other well-known leading figures in the Chinese community gave presentations about wildlife conservation at the conference of Northern California Chinese School Association, in which principals, school administrators and teachers from over 60 Chinese schools participated. Mr, Dai called on the administrators, teachers, students and parents to be involved in the tiger conservation promotion. Lixin Huang, president of American College of Traditional Chinese Medicine (ACTCM) and vice president of the Chinese Association for World Wildlife Conservation, tool charge of a planning meeting for the international conference in the topic of "Saving Tigers in the Year of the Tiger". A weekly planning meeting was set on every Tuesday until June 14, 1998. Mr. Ming-Kang Dai, Chairman of the American Chinese Zhi-Qing (Intellectuals) Association, vice president of CAWWC, was appointed to be in charge of the public relation affairs in the Chinese community. Chinese Association for World Wildlife Conservation (CAWWC) and many other organizations attended the Chinese New Year parade in Mountain View. Volunteers distributed "Tiger Conservation" commemorative cards to the public. A press conference was held in the conference room of the World Journal and an interview was conducted with BBC. Tiger Painting contest for children and Tiger Conservation Signature Drive contest started. Both of the events were advertised in the World Journal and the other major Chinese papers. Flyers and brochures were sent out to the Chinese schools and Chinese art schools. The contests would be concluded on May 25th. The volunteers taught the children the importance of the wildlife conservation in Chinese schools and encouraged them to enter the contests. They received positive feed back from both teachers and parents. The Chinese TV station, KTSF Channel 66, interviewed Mr. Albert Chang, president of CAWWC, regarding the goals and objectives of CAWWC. Mabel Teng, San Francisco Councilwoman, offered her full support by personally showing on the Tiger Conservation advertisement at KTSF Channel 66. Supported by the National Zoological Park Association, a planning meeting of Tiger Awareness Day Tour in San Francisco Zoo was held. Albert Chand, Lixin Huang, Ming-Kang Dai, and the administrators of San Francisco Zoo attended the meeting. Tiger Awareness Day was set on June 13, 1998 in San Francisco Zoo. Sponsors of this event include: World Wildlife Fund, Chinese Association for World Wildlife Conservation, American College of Traditional Chinese Medicine, American Chinese Zhi-Qing (Intellectuals) Association, National Zoological Park Association, San Francisco Zoo and Exxon Corporation. A planning meeting for the Tiger Conservation campaign was held in the Grand Palace in San Francisco Chinatown. A huge "Tiger Conservation" slogan was hung across the hall at the Mother's Day Fair sponsored by the Wold Journal in Cupertino, Volunteers gathered signatures, distributed the tiger conservation commemorative cards, and sold tickets for the Tiger Awareness Day tour in San Francisco Zoo. People responded to these activities with great interest and enthusiasm. Tiger Painting contest and the "Saving Tigers in the Year of the Tiger" Signature Drive contest concluded today. The Tiger Painting contest committee received 432 paintings. Some were from Canada. The Signature Drive contest committee received over 200 name lists from our children. The winner amazingly collected 479 signatures. A committee of evaluation for Tiger Painting contest was formed by some well-known artists and leading figures in the field of art in the Bay Area. After a thorough evaluation, the winners were selected. At noon, a planning meeting was held in the Chinese medicine society with Mr. Albert Chang in charge. Lixin Huang took charge of a summery meeting on tiger conservation at American College of Traditional Chinese Medicine. A press conference was held in a Chinese restaurant at Fisherman's Warf, San Francisco. All the major Chinese media in the Bay area attended. Opening ceremony of the Tiger Awareness Day in San Francisco Zoo was held for the first time in the U.S. and the world. Over 3600 people participated, including San Francisco Mayor Brown. 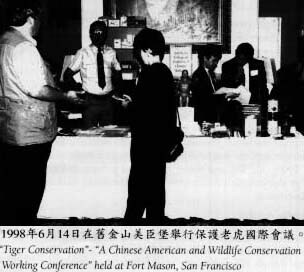 In order to encourage the Chinese community to participate the wildlife conservation activities, Chinese Association for World Wildlife Conservation, American College of Traditional Chinese Medicine and American Chinese Zhi-Qing (Intellectuals) Association initiated a conference on tiger conservation at Fort Mason in San Francisco. World Wildlife Fund, National Zoological Park Association, Save the Tiger Council and Exxon Corporation offered a full support to the conference. 150 participants from Hong Kong, Canada and the United States attended the conference. President Clinton sent his letter of congratulation to the conference. Some internationally well known leading figures, specialists and scholars in the field of wildlife conservation attended the conference. The following topics were discussed: (1) the current situation of tiger conservation; (2) the tiger conservation activities carried out among the Chinese community in San Francisco; (3) planning the future activities of wildlife conservation;(4) mutual understanding between the mainstream society and Chinese community regarding wildlife conservation and (5) how to have more Chinese Americans be involved in and know the importance and significance of wildlife conservation. The conference called on the people to take an action right now to protect our environment and save the tigers. TCM community took a lead in the promotion of tiger conservation. Chinese Herb Business Association of Northern California held a conference in San Francisco Chinatown and launched a consumer awareness campaign to stop illegal trading in tiger products and rhino horns. Mr. Burk H, Chung, president of Chinese Herb Business Association of Northern California, took charge of the conference. Mr. Alan H. Lau, vice president of the Chinese Herb Business Association of Northern California, Guifang Zhang, secretary-general of the Chinese Herb Business Association of Northern California., Ming-Kang Dai, president of American Chinese Zhi-Qing (Intellectuals) Association and Lixin Huang, president of American College of Traditional Chine Medicine (ACTCM) were present at the conference. World Journal, the largest Chinese newspaper in North America, carried a special report entitled "Wildlife Conservation and Culture Respect" about the "Saving Tigers in the Year of the Tiger" activities in the Chinese community in San Francisco. 60 articles and special reports had been carried on the Chinese newspapers and magazines so far. New York Times published an article about environmental protection, tiger and rhino conservation. The article also indicated that parts of tiger and rhino are used in traditional Chinese medicine (TCM). This article drew a special attention to the traditional Chinese medicine society and the Chinese wildlife conservation organizations. American College of Traditional Chinese Medicine even framed the article and placed it on the noticeable display board. World Wildlife Fund (WWF), American Chinese Zhi-Qing (Intellectuals) Association (ACIA) and Chinese Association for World Wildlife Conservation (CAWWC) decided to launch a major consumer awareness campaign to discourage the use of endangered species parts in traditional Chinese medicines. The campaign aimed to educate both TCM practitioners and consumers about the importance and significance of wildlife conservation and turn San Francisco Chinese medicinal stores into "clean" and law-abiding place. Sponsored by the American Chinese Zhi-Qing (Intellectuals) Association, two public performances in large scales were held in San Francisco and San Jose in memory of the unforgettable days that the school graduates experienced during the Cultural Revolution in China 30 years ago. Many signatures were collected at the performances. 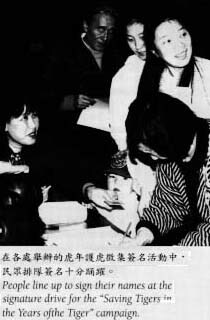 A planning meeting was held for the Tiger Conservation promotion activities in the remaining year of 1998. The following decisions were made at the meeting: (1). Design and print the posters of "Stop Illegal Trading in Tiger Products & Rhino Horns." (2). Distribute the posters to the Chinese medicinal stores throughout the Bay Area. (3). Design and produce "Save Tigers" shopping bags and distribute them to Chinese stores. (4). Publish supplementary textbooks in the content of "conservation of wildlife and endangered species" for Chinese schools. (5). Compile and print commemorative brochures of "Saving Tigers in the Year of the Tiger". (6). A summery meeting about "Saving Tigers in the Year of the Tiger" promotion activities was set on February 20, 1999. A "Tiger Conservation Game Corner" was set in the National Day celebration in the South Bay. The games, such as "Tiger Eats a Ball" and "Tiger Plays With a Circle", attracted a big crowds. About 1000 signatures were collected. A half page advertisement entitled "Leave Our Children a Living Planet" was carried on and would be continually carried on the World Journal periodically from September 1998 to February 1999. Mr. Ming-Kang Dai accompanied San Francisco Mayor Brown to Shanghai for the "San Francisco Week". 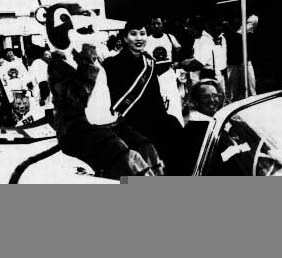 They were invited for an interview in the "Citizens and Society" program; the same program Mr. Clinton conducted a direct dialogue with the people of Shanghai during his visit in June of 1998. Mr. Dai and Mayor Brown had a direct dialogue with the people of Shanghai in the theme of wildlife conservation. Led by Mr. Ming-Kang Dai, the American Chinese Intellectuals Delegation went for a visit in Heilongjiang Province, China, the hometown of Manchuria Tiger. They were warmly received by the local people and government and discused tiger conservation with them. Mr. Bin Zhu completed the design of the poster entitled "No Buys! No Sales! No Any Ingredient of Endangered Animals!" Albert Chang, Burk Chung, Lixin Huang, Ming-Kang Dai, Alan Lau, and Bin Zhu formed an evaluation committee. After a thorough discussion, the committee decided to make some minor changes and appointed Mr.Qingbin Wang to be in charge of the printing affairs. SAT II (Chinese) would include the content of wildlife conservation in two years after several discussions with Dr. Tao-Chung Yao, Professor at Hawaii University, in order to encourage the students to be aware of the importance of wildlife conservation. The Chinese media in the Bay Area reported that the content of wildlife conservation was added into SAT. A press conference in San Francisco Chinatown was held. It was declared that one thousand copies of the posters " Stop Illegal Trading in Tiger Products and Rhino Horns!" were ready to be distributed to public. After the conference, volunteers distributed the posters to the Chinese medicinal stores throughout the Bay area and collected signatures for supporting the Saving Tiger promotion. Volunteers also explained the regulations and law about the wildlife conservation to the stores. More than 50 Chinese medicinal stores in the Bay area participated in the initial stage of the campaign, which included publication of a list of alternatives to tiger bone and rhino horn in traditional Chinese medicines. Lixin Huang, President of American College of Traditional Chinese Medicine, attended the annual conference of the U.S. Acupuncturist Association in Temple, Arizona. Thirty-nine TCM institutions approved and certified by U.S. Department of Education attended the conference. President Lixin Huang introduced the "Saving Tigers in the Year of the Tiger" promotion and the activities to educate the TCM practitioners and consumers not to use medicine with any ingredient of endangered animals in the Chinese community in San Francisco. Her speech was responded with a full support from the participants and all the participants stated that they would plan to include the content of wildlife conservation in their textbook and suggest the use of alternatives to horn, tiger bone and other endangered species parts. The pamphlets "Saving Tigers in the Year of the Tiger" were printed, and a summery meeting about the promotion activities in the past months was held. Mr.Dan Luo completed the design of the "Save the Tiger" shopping bag. Four hundred pamphlets entitled Saving Tigers in the Year of the Tiger were distributed to the participants at the "Christmas Party of the American Chinese Intellectuals" in Fremont. Hundreds of signatures were collected for the tiger conservation promotion. The supplementary textbook for children Pictures and Words of Tiger Conservation has been successfully completed and ready to be published. A press conference was held in the Grant Palace in San Francisco Chinatown. The plan on the conservation of wildlife and endangered wild species in 1999 was introduced at the conference. Thousands of "Save the Tiger" shopping bags have been distributed to Chinese medicinal shops throughout the Bay area. Printed in both Chinese and English, the shopping bags contain messages about wildlife conservation and traditional Chinese medicine. Mr. Burk H. Chung, president of Chinese Herb Business Association of Northern California, received the shopping bags as the representative of the TCM companies. Copies of supplementary textbook, Pictures and Works of Tiger Conservation would be distributed to the Chinese schools and the "A" students will be awarded with honor of certificates and prizes. A summery meeting about the campaign, "Saving Tigers in the Year of the Tiger" was held in San Francisco. A summery report and a future plan were presented and the newly published autograph booklets, Saving Tigers in the Year of the Tiger, were distributed at the meeting. More supplementary educational materials about the wildlife conservation will be published in Chinese language. The plan for 1999 will focus on the education of wildlife conservation. Previous article : "Saving Tigers" shopping bags and "Pictures and Words of Tiger Conservation". Next article : More Photos!